The Ming Courtyard is just a short walk from both the Dongzhimen transport hub (Airport Express/ Subway Line 2, exit D/Rail Train 13, the Beixinqiao station Line5 exit C and several public buses). 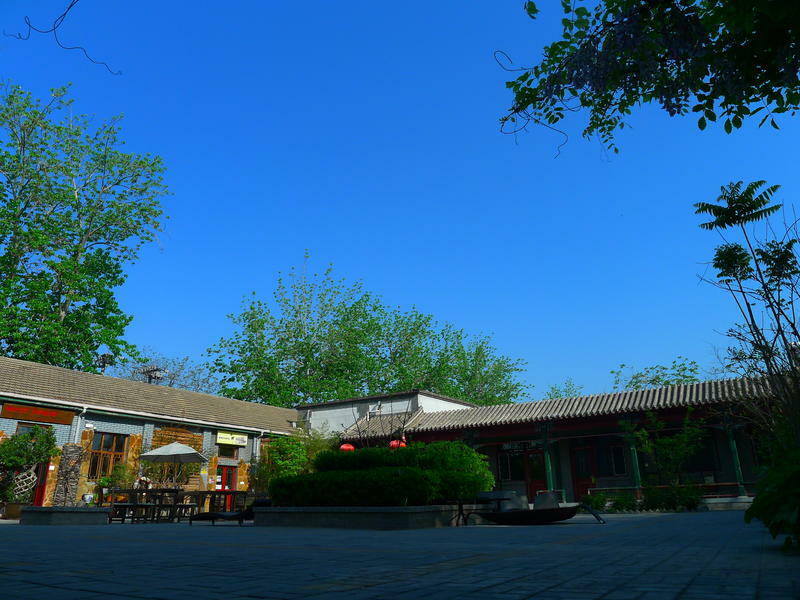 Our hostel is located in a traditional Beijing Hutong (a Northern Chinese style narrow street). We are in the middle of GUIJIE (ghost street). The Guijie street is famous for its fantastic, affordable food and traditional Beijingness style. Our neighbourhood is also known for its colorful and attractive ambiance, especially at night. The Ming Courtyard hostel's rooms are ste around our spacious courtyard. Both private and mixed dorms are available. During your stay at our hostel you will enjoy our pleasant staff, comfortable surroundings, free WIFI and our Bar/ Restaurant. Why not Skype home, while sipping on a refreshing beverage and getting some sun on a lounge? Or simply step outside to experience life like a local as you stroll through some of the Hutong alleyways and experience Beijing as it has been for generations. If you are a Chinese mainlander and want to stay in the dorm, you will need to pay for all unused beds in the dorm. We cannot allow anyone else in your dorm. This is Beijing's local policy. Thank you for your understanding. *Take the Airport Express train to the terminal station Dongzhimen (about 20 minutes, cost 25CNY, less than 4USD), then by taxi (10CNY)or tri-cycle (10CNY) just a few minutes,or walk (15 minutes). *Take the Airport Shuttle Bus and stop at the Dongzhimen(about 40 minutes, cost 16CNY),then by taxi (10CNY) just a few minutes,or walk (10 minutes). *Take subway line 2 for 1 stop at Chongwenmen station, then transfer Line 5, exit at Beixinqiao Station (exit C), turn right. Walk to the first traffic light ( 50 meters) turn right ( Do not cross the road) is the Dongzhimennei Street. Walk 5-- meters there will be an ATM of the Construction Bank at the entrance of Xintaicang Lane (新太倉胡同). Turn right wald 100 meters. We are on the lefthand Ming Courtyard. Take off at the Dongdan Station of the Line 1, then transfer Line 5 at the Beixiqiao Station. From there please see the 'From Line 5' for you informations. Get off at the Xizhimen Station of Line 4, then transfer Line 2 at Yonghegong Station (Lama Temple), from there take the Lin 5 and stop at the Beixiqiao Station. From there please see the 'From Line 5' for you informations. Take the subway to Beixinqiao station, take Exit C and turn right onto the small lane and walk 40 meters to where the small lane meets the street.Turn right and walk towards the intersection/traffic light ahead. At the traffic light turn right onto Dongzhimen Inner Street. Walk about 5-7 minutes and you will see a China Construction Bank ATM center on your right with a small convenience store beside it. Turn right into the small lane immediately past the ATM/convenience store (Xintaicang Alley). Walk 2-3 minutes and you will arrive at our location on the left with a red sign 'Ming Courtyard'.